Dr. Angela J. Aldrich was born in Vermillion, South Dakota, and began her practice with Siouxland Obstetrics & Gynecology, P.C. in 1999. She received her Bachelor of Science and Master of Science Degrees from the South Dakota School of Mines and Technology in Rapid City, South Dakota, and earned her Doctor of Medicine degree at the University of South Dakota School of Medicine in Vermillion. 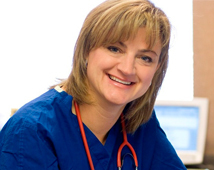 Dr. Aldrich completed her OB/GYN residency program at the Saginaw Cooperative Hospital in Saginaw, Michigan. Dr. Aldrich and her husband, Kris, are parents of three daughters and a son.